Machines with a closed or open frame that can work mostly irregular stone or uneven boulders. They can work in quarries, as well as in stone processing laboratories. It’s the operator who decides when and how to split the input material, thanks to the manual command. All manual machines are equipped with blades and with tools adjustment. 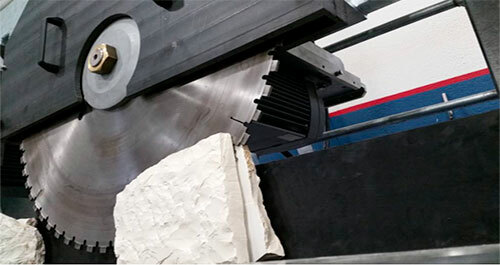 Machines characterized by a closed frame that work regular or sawn blocks or strips automatically. These automatic lines can be created for high quality and big quantities production, thanks to the combination with the different handling systems and various automatisms. The splitting plants can also be complete with automatic systems for loading and unloading and / or palletizing of finished products. Unlike previous typologies, these machines are characterized by a horizontal splitting (and no longer vertical) that opens particular materials horizontally. They are ideal for veined materials and for recovery waste material from stone sawing.